With a desire to work in healthcare from an alternative perspective, Sarethia was particularly interested in massage therapy from the start. She wanted to be an active participant in improving and optimizing health in others, and began her journey in January 2005. She is now an experienced Registered Massage Therapist after practicing for over seven years. 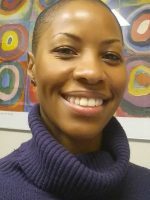 Sarethia’s approach to massage therapy is based on a holistic view of the individual. She considers the client’s primary complaint but also works to identify other contributing factors that may be an underlying cause for the client’s condition. Myofascial release, trigger point therapy, joint mobilization, and specific stretching techniques, as well as Swedish/deep-tissue massage, trigger-point therapy, prenatal massage, and aromatherapy. In her spare time, Sarethia likes to practice pilates, and enjoys movies and travelling.